How much current can you get from speed? 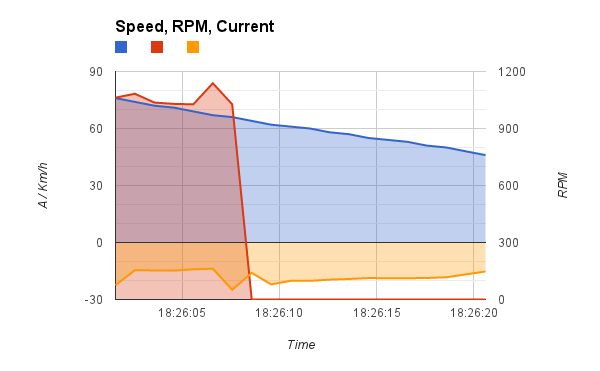 RPMs in red, right axis, useful to check when the engine stops beeing dragged. change current in yellow, left axis, negative values are indicative of recharge. The engine continued to spin without burning any fuel, then at 66 km/h it stopped (see the sudden break in the red line). Charging current is not steady, it follows the speed, but not linearly (check the yellow line, lower values mean higher charge). Higher current values are in the lower part of the graph. 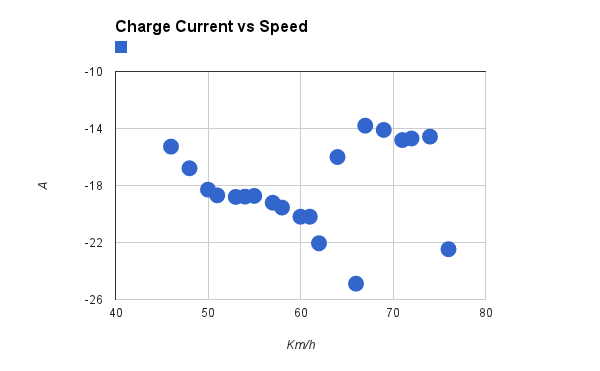 The higher recharge effect is at 66 km/h with 24A. That is precisely the speed where the engine stopped, but neighbouring values vary widely. The slope returns to a linear behavior at 62 km/h with 22A. So, if you're going to drive down a hill and you want to maximize your recharge, it's better to drive at 60 km/h rather than 70.